Neil Kodesh. Beyond the Royal Gaze: Clanship and Public Healing in Buganda. 2010. 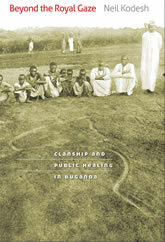 Winner of the 2011 African Studies Association Herskovits Award, Beyond the Royal Gaze shifts the perspective from which we view early African politics by asking what Buganda, a kingdom located on the northwest shores of Lake Victoria in present-day Uganda, looked like to people who were not of the center but nevertheless became central to its functioning. Drawing on insights from a variety of disciplines—history, historical linguistics, archaeology, and anthropology—Neil Kodesh argues that the domains of politics and public healing were intimately entwined in Buganda from the sixteenth through the early nineteenth centuries. Drawing on extensive fieldwork conducted throughout Buganda, Kodesh demonstrates how efforts to ensure collective prosperity and perpetuity—usually expressed in the language of health and healing—lay at the heart of community-building processes in Buganda. Kodesh’s work offers a novel approach to the use of oral sources and opens up new possibilities for researching and writing histories of more distant periods in Africa’s past. Beyond the Royal Gaze will appeal to students and scholars of health and healing, political complexity, and the production of knowledge in places where limited documentary evidence exists.